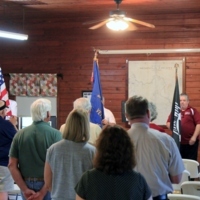 The posting of the colors ceremony at the Geneva Community Center in Geneva, Florida. Three men stand behind the recently mounted flags to the left of a white podium with a red, white and blue ribbon. Original color photograph: RICHES, University of Central Florida, Orlando, Florida. Geneva Historical & Genealogical Society Collection, Geneva Collection, Seminole County Collection, RICHES. Originally created by Geoffrey Cravero and published by RICHES. Copyright to this resource is held by RICHES for educational purposes only. Tuchman, Barbara W., and Robert K. Massie. The Guns of August: The Outbreak of World War I. 2014. Genealogical Society, Inc. 100 Year Memorial remembering Roderick 'Perry' Taylor and the 564 persons who lost their lives on the R.M.S. Leinster Oct. 10, 1918, WWI, Irish Sea. October 10, 2018. Cravero, Geoffrey. “Posting of the Colors.” RICHES of Central Florida accessed April 23, 2019, https://richesmi.cah.ucf.edu/omeka/items/show/10417.